Possibility is the condition or fact of anything you can imagine being possible. The Latin origins of the word hint at ability, as in your ability to see beyond the right now into the coming; past the problems of the day into the the good that will come of them. Possibility isn’t about giving up today it’s about being mindful of today, of the decisions you make and the lives that you touch. Possibility also refers to something that “could happen”, that is not precluded by the facts, but usually not probable. Impossible denotes that something cannot happen or be done. Impossible is without hope or progress; it is the death of opportunity, adventure, aspiration. I, for one, don’t believe in the word impossible. Impossible is that thing that is just beyond the edge of my current understanding; it’s something that I haven’t done yet. Yes, I know that it’s impossible that I spout wings and fly. It’s not impossible to learn to soar in a plane, ultralight or parachute. It’s impossible to do many things….until you put your mind to the possibility that it – change, in it’s strange and precarious glory – presents openness in your life. of the things which we are capable of performing. 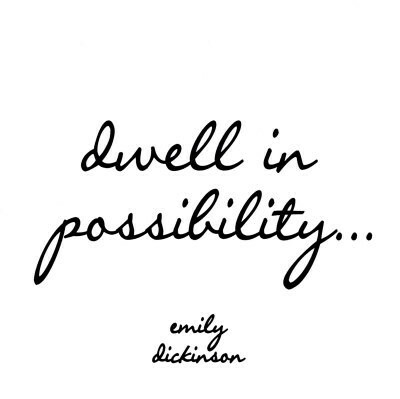 How do your think of possibility? Problems? Change? When something ends, a relationship, job or dream ~ Is it really a closed door….or a new opening? When you feels the pangs of outgrowing the ‘young’ version of yourself, and instead find life morphing and yourself molding into the new possibilities…. Is it really the end or just the beginning of something more wonderful than you can imagine? That hard time in your life that you’re mourning….did you really lose out or did you learn? For me, each of these hard times in life is about retooling my thinking, honing my focus, changing my perspectives, breeding new hope. It is hard enough to live the human existence; without the base of deep, soul borne hope….. Impossible without it, I should think. It’s impossible to live an authentic life if you’re seeped in half truths, half truths about who you are, where you’re headed, what you honestly want to leave behind for this crazy world. It’s impossible to live a happy life if you’re always focused on the negative, steeped in the toxic, ruled by chaos, controlled by another. It’s impossible to live a fulfilled life if you’re ignoring your own destiny, what you were called to do. Truth is impossible if you’re shielding the real of what and who you are from the very light that you need to change and grow. An oxymoron, isn’t it? Nothing is impossible until you make it that way through the very decisions that take you to the heights of possibility. All of these impossible things are possible….once you begin to live in the light of allowing them to be, growing with them and seeking the best form of what and who you are. Rethink “possibility.” What does that mean to your daily attitude? and a faith in the possibility of something better. It irritates me to be told how things have always been done. I go for anything new that might improve the past. GOD in the infinite wisdom of earth, love, time and understanding does more than make possible…..he gives revelation where there is none, courage to do the unlikely, heart to be what is called….not your precepts of”should”….Yahweh is not for the faint or willing to fail. …..